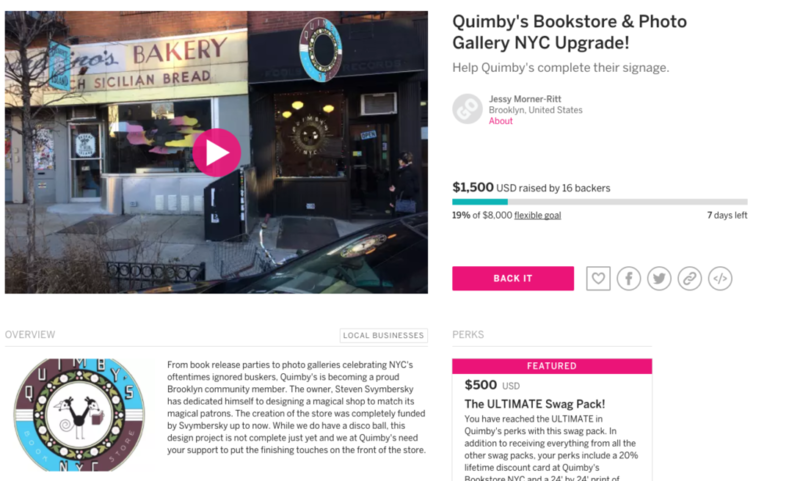 Help the Quimby’s Bookstore & Photo Gallery NYC Upgrade! Help the awesome Steven Svymbersky pay for custom-made, hand-painted Chris Ware signs to be displayed outside Quimby’s Bookstore NYC! It’ll look so great, you’ll help pay for it, and you’ll get cool swag. Also, did we mention there will be gold-leaf rays, a “donut-shaped” sign, and a “fake” sign on the building over the window that advertising Svymbersky’s Cabinetry and Conveyance? Oh yes. Indie-Go-Go campaign here. Info courtesy of Quimby’s Founder Steven Svymbersky! For more info: Quimby’s Bookstore & Photo Gallery NYC Upgrade Campaign. Tags: Quimby's Bookstore & Photo Gallery, Quimby's Bookstore NYC. 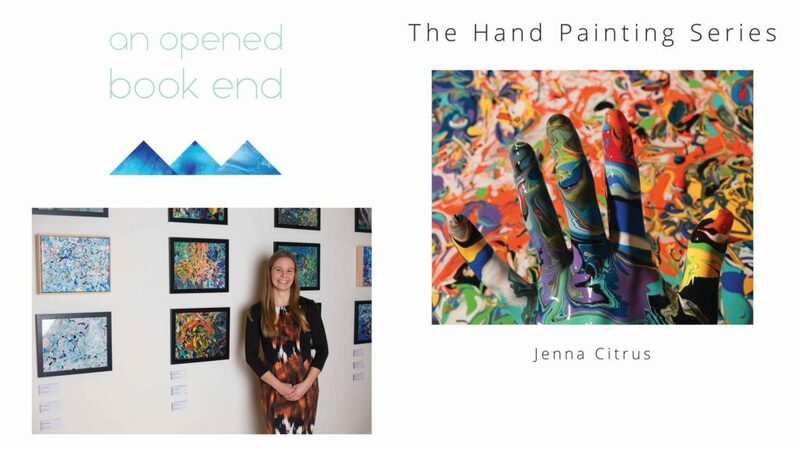 Jenna Citrus is traveling to Quimby’s in Brooklyn, New York to release two new books: The Hand Painting Series and An Opened Book End on Sat, April 8th at 2pm. An Opened Book End weaves a fabric of dreamlike streams into fragmented realities. Pursuing memories from the past and turning experience into verse, Jenna Citrus recounts her years from 15 to 22. Allusive references are made to relationships, trust, heartbreak, family, technology, women, art, culture, creativity, society, inner being, sexuality, and culture’s influence on current existence through internal thought and reflection. Jenna Citrus has always been a hands-on type of painter. When she first started creating her painted designs in 2007, she rarely used brushes. Instead she used her fingers, palms, and sometimes pallet knives. As her work progressed, she found herself pulled toward splattering paint from the paint that pooled in the palm of her hands, creating mixes of colors that were pure and bold. Citrus has worked in a variety of media including graphic art, photography, and portraiture. Jenna wanted to find a way to incorporate the process of how the hands could sometimes be more of a masterpiece than the canvas they were working on. She created a series of images utilizing hands as her canvas. From the age of 10, Jenna enjoyed writing short stories, around 14 her interests shifted to poetry and painting, in a few years she added photography to her craft. She graduated from the University of Southern Indiana in 2015 then was awarded the Efroymson Bridge Year Fellowship in 2016. She is currently working as a full time creator. To see a preview of the books, check out her Kickstarter. Here’s the link for the Facebook invite for this event! Tags: An Opened Book End, Jenna Citrus, Quimby's Bookstore NYC, The Hand Painting Series. In New York? GRAND OPENING QUIMBY’S BOOKSTORE NYC, 2/4/17! At 7:00 PM, Steven Svymbersky will give a short slide show talk on the history of zines followed by champagne and hors d’oeuvres. This event is also the opening for the first major survey of works by sculptor and collage artist, Eric Kirsammer. 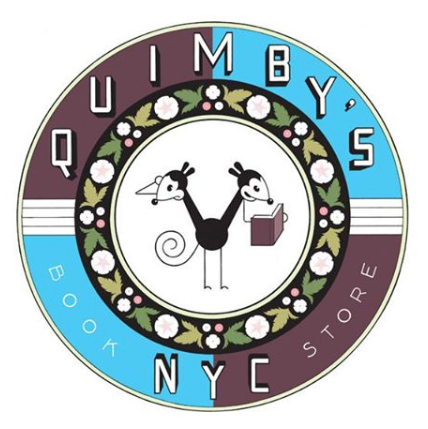 Quimby’s Bookstore NYC joins Desert Island Comics on Metropolitan Ave in Williamsburg to bring you every cool, queer, sick, rad, aberrant, dope, weird, impossible publication available, something you never knew existed but that now you need. Steven Svymbersky originally opened Quimby’s Bookstore in Chicago’s Wicker Park neighborhood in 1991. That store recently celebrated their 25th anniversary. Quimby’s specializes in zines, alternative magazines and underground books. Subject matter includes LGBTQ, Anarchism, Tattooing, Creative Resistance, Drugs, Minority and Women’s Issues, Taxidermy, Occult, Punk Rock, Cycling, Urban Farming, Vegetarianism, Morbid Anatomy, as well as the more outré artists working in fiction and photography. 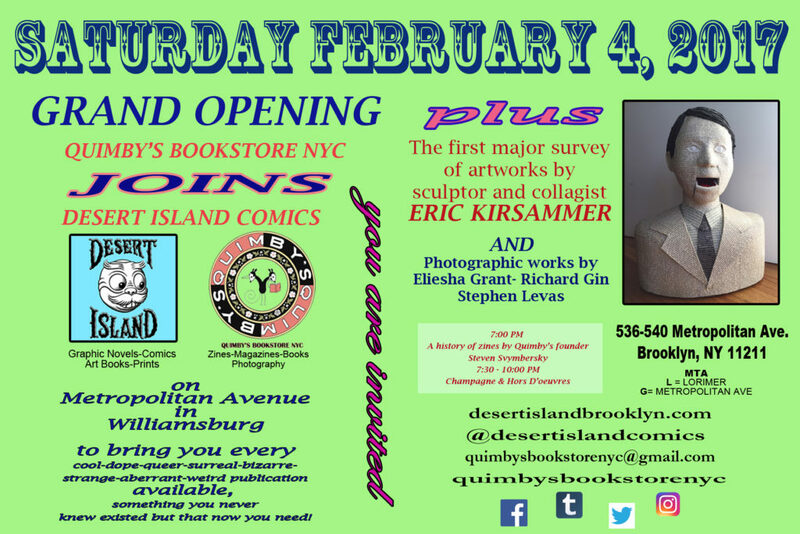 In December 2016, Svymbersky opened the second Quimby’s location next door to Desert Island Comics (Best Comics Resource, Village Voice 2016). Desert Island has been on Metropolitan Ave over eight years. Founder, Gabe Fowler is also the publisher of the comics anthology Resist!/Smoke Signals and every year in November organizes New York’s largest underground comics convention, Comics Art Brooklyn. Tags: Gabe Fowler, Grand Opening, Quimby's Bookstore NYC, Steven Svymbersky. Quimby’s Bookstore NYC OPEN FOR BUSINESS!!!! Wanna consign stuff? Here’s a link to the consignment form as well as what Quimby’s Bookstore NYC will and won’t take.